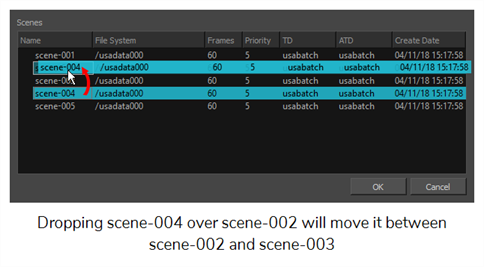 You can change the sequence of scenes in your job, which affects the order in which the scenes appear in the job throughout the system. You can place a scene anywhere in the Scenes list or you can sort them alphanumerically. Select the job whose scenes you want to re-sequence from the Jobs panel. From the top menu, select Scene > Reorder. Right-click anywhere in the Scenes list and select Reorder. The Reorder Scenes dialog box appears. In the column header, click on Name, File System, Frames, Priority, TD, ATD or Create Date to automatically sort all the listed scenes in order of value in the selected column. For example, to reorder scenes by name, click on Name. To reorder scenes by creation date/time, click on Create Date. TIPYou can click on a column header twice to sort the scenes in reverse order. Click and drag on a scene to move it, then drop it where you want the scene to be listed. The scene will be moved after the scene over which it was dropped. Once the scenes are ordered, click OK.